The 2016 Lifeboat Foundation Guardian Award has been given to Julian Assange in recognition of his quest to create an open world where the truth is told. He has worked to expose government lies, abuses, corruption, and surveillance. He is the second whistleblower to receive the Guardian Award which the Lifeboat Foundation has been awarding since 2002. Why does Lifeboat Foundation think that government abuses and lies should be uncovered? Because powerful technologies that will soon be available could lead to a 1984-type society that would not only be unpleasant but could give the government the power to do terrible things that become existential threats. Secret surveillance can easily become excessive surveillance. Lies could cover up deadly weapons programs whether they are biotech, nanotech, or AI-based. We are moving past the point where the most deadly weapons are nuclear weapons. Weapons that can self-replicate are usually more deadly as the release of a weapon in one country could quickly affect the world. Today such weapons are bioweapons. Tomorrow such weapons will be nanoweapons or rogue AIs. A government full of lies and corruption is unlikely to protect us against such threats. In the book review of Cypherpunks: Freedom and the Future of the Internet by our Harry J. Bentham, Harry wrote that Julian Assange was illuminating the political dangers of state “total surveillance” of the uploaded lives of the population of the entire industrialized world, which is a possible step towards a 1984-type society. Of course, many of our members are against surveillance and some probably think the government is not being invasive enough with its surveillance. But without knowledge of what the government is doing, it is impossible for its citizens to debate the best possible course of action. 3) While surveillance is quite extensive, it seems to be remarkably poor at stopping terrorism. The endless terrorist attacks around the world only seem to be increasing in frequency. Until we know the details of how governments do their surveillance, we will have no chance to fix this problem. It is possible that since governments don’t trust their citizens to even know what surveillance is being used that this discourages citizens from feeling like they are a valued part of society. Such “unvalued” citizens may feel their input doesn’t matter and therefore are discouraged from reporting suspicious activities. Julian Assange is an Australian computer programmer, publisher, and journalist. He is editor-in-chief of the organization WikiLeaks, which he founded in 2006. 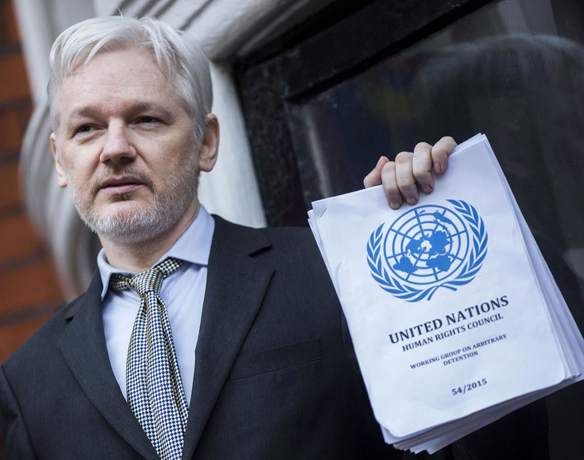 Despite being confined to the Embassy of Ecuador in London since August 2012 due to legal troubles in Sweden, he played a major role in the U.S. election in 2016 exposing many truths. The United Nations’ Working Group on Arbitrary Detention found, by a majority in early 2016, that he has been “arbitrarily detained” and that his detention should be brought to an end but he remains confined to the embassy. Listen to Julian Assange interview and Full Event: Wikileaks/Assange Hold Press Conference 10/4/16.